As if all the amazing-sounding careers in the food and beer industries didn't already make you hate your boring office job enough, every once in a while, spectacular positions that'll pay you for beer drinking and Instagramming just add insult to injury. 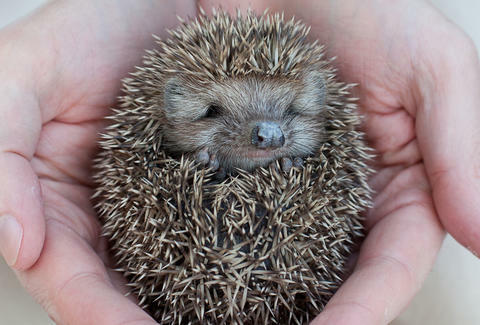 Well, it looks like another one of those roles has emerged, and it involves helping adorable hedgehogs all day. Suffolk Wildlife Trust, a wildlife conservation group based in Ipswich, UK, is seeking candidates for the roll of Hedgehog Officer (yes, that's the actual job title), according to a report by The Telegraph. And as the official job listing explains, they'll pay you £24,000 (approximately $31,000) per year to work and play with hedgehogs all day in an effort to secure the spiky mammals' future in the Suffolk region. "We are looking for an inspirational individual who will be the face of hedgehog conservation in Ipswich," the listing states. "You will use your knowledge of nature conservation and hedgehog ecology to lead an ambitious project seeking to make Ipswich the most hedgehog friendly town in the UK." A wildlife audit declared Ipswich a "hedgehog hotspot," which sounds like a date night setting for Sonic the Hedgehog. The role also entails monitoring the area's hedgehog activity and overseeing the creation of a street-by-street network of hedgehog habitats, according to the listing. Applications are due by July 13th. Basically, they really love hedgehogs and you can be their "Hedgehog Officer" if you do too. Tony Merevick is Cities News Editor at Thrillist and is probably -- probably! -- better at writing than dealing with hedgehogs. Send news tips to news@thrillist.com and follow him on Twitter @tonymerevick.